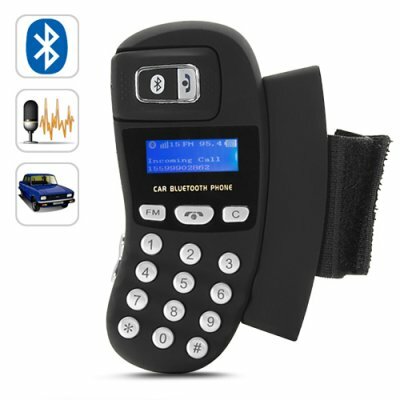 Successfully Added Bluetooth Car Kit (Hands Free, Caller ID, FM Transmitter) to your Shopping Cart. Bluetooth Car Kit (Hands Free, Caller ID, FM Transmitter) Hands free communication when driving just got a whole lot easier with our newest Bluetooth steering wheel kit. This Bluetooth steering wheel kit is basically an in-car remote control for your mobile phone. It attaches securely to your steering wheel and gives you safe and easy control over your phones basic calling functions without actually handling your phone or taking your hands off of the steering wheel. It uses a powerful built in microphone that guarantees your listeners will clearly hear every word you are saying, and features 3 convenient options for talking while driving. Built-in speaker- The B16 comes with a great built in speaker that is both loud and clear. If you don’t have a car radio then this is the perfect option for you. Car speakers- Use the car radio system to wirelessly receive your phone conversation. This is the most common way people use the B16 because it allows you to listen to your conversation at a much louder volume than you could with only the Bluetooth device itself. Bluetooth earpiece- By using the included earpiece you can use the car radio independently of the Bluetooth system. This is useful if you don’t want to change the radio station but still want hands free communication. This Bluetooth adapter is very simple to use and attaches securely to your car’s steering wheel via a universal velcro strap. The blue LCD is bright, clear, and easy to read, and there are smartly located buttons for answering and ending calls, number pad for dialing phone numbers, volume control, and a FM button to change between using the devices built-in speaker or your car’s own speakers. To connect your phone to this device you simply scan for and connect to the Bluetooth device using your mobile phone and the passcode 0000. It doesn't get much simpler than that! If you’re looking for safe and easy phone control right from your steering wheel, then the B16 is the right choice for you. Unlike other Bluetooth kits, the B16 actually comes with a caller ID function that displays and announces the incoming phone number so you can know exactly who’s calling without actually looking at the phone. Additionally, this specific model can even access your phone’s contact list so your hands will never need to leave the steering wheel when dialing a phone number. Whether you’re a delivery driver who uses the phone a lot, or a good parent who wants to ensure their child is safe on the road, the B16 Bluetooth kit will make talking and driving a much easier and safer experience for all. At a great wholesale price this unit is also excellent for the re-sale market, OEM market, or company use. As always, this item comes with our famous 12 month guarantee and is in stock and ready for next day shipping. The B16 is available only from the leaders in wholesale electronics, Chinavasion! Safe and easy hands free communication! If you are listening to music being played through the car stereo when a call is received, the music will stop playing automatically to allow you to accept the incoming call. The adapter is designed with your convenience and safety in mind. Can I get my company logo printed on the B16? Yes. If your bulk order is more than 500 we can have your company logo or name printed on this product. This is a great little gadget, bought 2 of them. Speaker is loud and clear, fm works fine too.